Healthcare professionals need to be not only experts in their chosen clinical discipline, but be competent professionals with leadership and management skills that enable them to be more actively involved in the planning, delivery and transformation of services for patients. 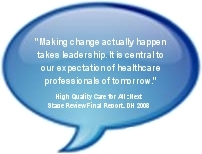 High Quality Care for All: NHS Next Stage Review (2008) highlighted the importance of effective leadership in the system and, in particular, the need for greater involvement of clinicians in leadership. Incorporating leadership competences into education and training for all clinical professions will help establish a stronger foundation for developing high-level leadership capability across the health service. The Clinical Leadership Competency Framework (CLCF) describes the leadership and management competences clinicians need to become involved in the planning, delivery and transformation of services. The CLCF is derived from the Medical Leadership Competency Framework (MLCF), jointly developed by the Institute for Innovation and Improvement and the Academy of Royal Medical Colleges. The CLCF is built on the concept of shared leadership, which is not restricted to people who hold designated leadership roles, and where there is a shared sense of responsibility for the success of the organisation and its services. Acts of leadership can come from anyone in the organisation, as appropriate at different times, and are focused on the achievement of the group rather than of an individual. Therefore shared leadership actively supports effective teamwork. • Help with personal development and career progression. The NHS Institute for Improvement and Innovation was commissioned in February 2010 by the clinical leadership work-stream of the National Leadership Council (NLC) to test the applicability of the leadership competences of the MLCF for other clinical professions. The aim of this project was to work with the clinical professions to build leadership awareness and capability across the health service, by assessing the readiness of 21 regulated clinical professions to embed leadership competences in undergraduate education, postgraduate training and continuing professional development. The initial phase of the CLCF project was to create a document that describes the generic leadership and management competences that clinicians’ need, and to use this in discussions with the individual regulated clinical professions. The purpose of these discussions was to assess the extent to which each profession already covers leadership competences in their undergraduate and postgraduate curricula or standards. For those professions that do not currently and explicitly address leadership at these levels, our discussions have focused on their readiness to adopt a framework such as the CLCF. The NHS Institute consulted with 97 individuals from 51 organisations representing the 21 regulated clinical professions, their regulatory bodies, policy makers and the higher education sector. The results are very positive - the level of interest is high amongst all the professions consulted, and there is an overall willingness to adopt the CLCF. There are a number of opportunities available to support this adoption, and there is a clear need to maintain momentum to complete and embed the CLCF such as working with the various professional bodies to ensure their standards and curriculum guidance describe leadership and align to the CLCF. The NHS Institute was commissioned, in January 2010, by the clinical leadership work-stream of the National Leadership Council (NLC) to test the applicability of generic leadership competences in the CLCF for 21 regulated clinical professions. The aim of this work is to work with the clinical professions to build leadership awareness and capability across the health service, by embedding leadership competences in undergraduate education and postgraduate training and continuing professional development. There is recognition that leadership is important and there is a need to further develop the leadership capacity within the clinical professions. Practitioners embrace the concept of the CLCF because it affords a common and consistent approach to professional development, based on their shared professional values and beliefs, and which is nested within the professional domain and standards not organisational structures which may or may not exist in the future. The willingness of the professions and the practitioners is very important, however, there are broader system-wide considerations – regulatory, education and workforce - that are equally important and without which the professional bodies would find it difficult to adopt and embed the CLCF. The various professional bodies are now working to ensure their standards, curriculum guidance, frameworks – training, education and continuing professional development (CPD) - describe leadership and align to the CLCF. Employing and workforce bodies, such as the NHS, but also private sector companies, have endorsed the CLCF and are working to describe leadership development within their various processes. It is important that leadership development is delivered at a preparatory phase as an aid to inter-professional working. Leadership and management competences within existing education and training is varyingly described, applied and assessed, and tends to focus on the practitioner rather than the wider systems in which they function; they are rarely described as leadership standards or competences. Higher Education Institutions (HEIs) tend to relate their content to the minimum or threshold standards set down by the relevant regulator as well the professional body’s guidance. All the people we met agreed that the key to ensuring adequate coverage within pre-registration education and training in HEI curricula is the HPC standards of proficiency (relevant to the professions regulated by the HPC). The National Skills Academy for Social Care was established by the Department of Health in October 2009 to raise the standard of training and learning of social workers. The Academy is about to start developing a leadership framework and there is an opportunity to create a bridge between health and social care through leadership using the CLCF as a basis. We intend to collaborate to determine how the CLCF can be adapted to suit social care. The work that has been undertaken to date shows that there is widespread recognition that leadership is important, and that the development of clinical leadership is viewed as absolutely critical. The CLCF is finding wide acceptance because it offers a common, consistent and familiar approach to professional development for clinicians. Its particular relevance to the working practices and mindsets of clinicians is recognised by regulators, educators and the wider professional community, who are working to ensure that their standards and frameworks align to the CLCF. The next step for the CLCF project team is to work with professional bodies, regulators and education establishments to help them to embed the CLCF effectively, and this work is already under way. The National Leadership Council (NLC), chaired by Sir David Nicholson Chief Executive of the NHS, was established to transform leadership throughout the NHS by supporting the service in identifying its leaders and to embed a new leadership culture. The membership of the NLC was designed to achieve a diverse representation of leadership knowledge and expertise from both inside and outside the NHS. The NLC is a sub-committee and accountable to the NHS Management Board. The Council will, initially, focus on five priority areas; Clinical Leadership, Top Leaders, Board Development, Emerging Leaders and Inclusion. The Council are working closely and collaboratively with a range of stakeholders in each of these priority areas. For more information or to request a copy of the full report, please email Paul W Long, Project Director.